TAV Airports served 87 million passengers and posted net profit of EUR 163m in 2017 nine months. TAV Airports Holding (BIST: TAVHL, “TAV”), a global player in airport operations, announced its nine month 2017 net profit of EUR 163 million and revenue of EUR 854 million. TAV Airports Holding Executive Board Member & CEO Sani Sener stated “2017 has been a year of recovery from an aviation market that has been in downtrend for approximately 18 months. The recovery in our Turkish airports started in the second quarter and picked up full traction in the third quarter. Istanbul Ataturk Airport’s international Origin & Destination (O&D) passenger growth was 6% for the first nine months. Ankara Esenboga Airport enjoyed significant growth in international passengers (35%), thanks to year-on-year effect of routes that started late 2016. Georgia showed 44% growth in first 9 months, as a result of increased traffic to Russia, former CIS countries, Middle East and Israel. Medinah continued its eye catching expansion with 20% growth. Macedonia traffic managed a double digit growth of 12%, as Wizzair based its 4th aircraft at Skopje in July. 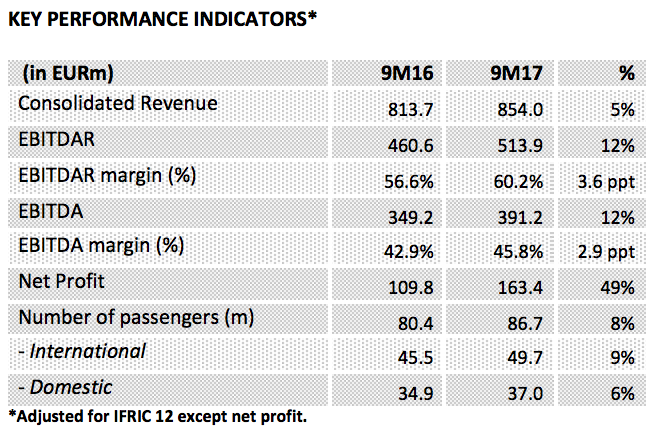 In the first nine months we recorded 5% revenue growth, 12% EBITDAR growth and 49% net income growth in Euro terms. The quarterly revenue, EBITDAR and net profit in the third quarter were the highest in TAV’s history. The revenue and EBITDAR growth was better than our initial guidance set in the beginning of the year, so we have revised guidance to 1-3% revenue growth for the full year and 6-8% EBITDAR growth, from flat revenue and EBITDAR growth. We have spent EUR35 million for new investments this year, of which EUR17 million was spent on Tbilisi Airport capacity expansion. Georgia’s 44% passenger growth for the year confirms our decision to invest further in the airport. We won the concession to operate three new airports in Kingdom of Saudi Arabia (Yanbu, Qassim and Hail). Negotiations on the Cuban airports are ongoing as ATU and BTA are also preparing for new projects in different locations. We now have lounges in fifteen countries including USA, Chile, Germany, Switzerland and Kenya. On the other hand, TAV Technologies is winning IT projects in the Gulf Region. During the third quarter Groupe ADP bought 8% stake of Akfen in TAV Airports and international investors bought 3.6% stake of TAV Airports from Tepe and Sera, increasing TAV Airports’ free float to 44.3%. With these transactions both Groupe ADP and international investors have reconfirmed their confidence in TAV Airports and in Turkey in general. TAV Airports will be Groupe ADP’s main international expansion vehicle in our core geographies.